A video out of Asia shows what is allegedly a totally redesigned pair of Apple in-ear headphones, with the new unit reportedly slated for bundling with the company's much-rumored next-generation iPhone when the handset launches this fall. Vietnamese website Tinhte.vn (via MacRumors) posted the video and accompanying high-quality images of the purported device on Saturday, noting the Apple-branded product will likely be introduced either alongside the sixth-generation iPhone. The site believes the in-ear headphones came from a Vietnamese Foxconn plant as cable labeling reads "Designed by Apple in California. Assembled in Vietnam." While the validity of the claims can't be verified, Tinhte says the build quality of the part has them convinced it is a legitimate Apple product. 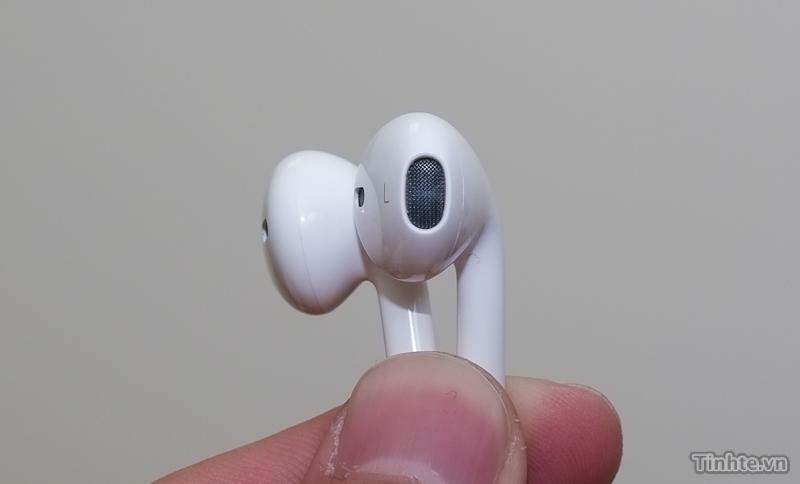 As for the design, the in-ear unit is somewhat a departure from current earphone models from Apple, featuring a truncated teardrop shape that is supposedly more comfortable than the gratis set supplied with the iPhone. It appears the alleged headphones are essentially a combination of Apple's current lineup and use dynamic, or moving coil, technology in a seamless chassis that partially enters the ear canal. What looks to be two ports can be seen behind the headphone's protective mesh grate, hinting at a dual-driver, balanced armature system akin to the one seen in Apple's higher-end after-market in-ear unit. The use of such tech is unlikely, however, as the slits seen on the back of the earpiece and bottom of the stem are not in line with such a setup, which usually calls for a sealed chassis to perform optimally. Also of note is the apparent lack of an inline microphone and volume controls, two features necessary for use with an iPhone, however the tell-tale TRRS connector (3.5mm headphone jack with four contacts instead of a stereo headset's three) needed for mic functionality can briefly be seen near the end of the video. It is possible that the mics are embedded within the headphone itself, though it is impossible to make any definitive judgment from images and video alone. Apple is widely expected to release the next-generation iPhone on Sept. 12, with a U.S. release to follow on Sept. 21.